Several major advertisers are fleeing ‘The O’Reilly Factor’ after “disturbing” reports of inappropriate behavior by Bill O’Reilly are revealed by The New York Times. Bill O’Reilly has been one of Fox News’ biggest money makers – and over the years they have spent a lot of that money quietly settling a multitude of harassment claims against the controversial host. The New York Times revealed over the weekend that O’Reilly and Fox News have paid out a total of $13 million since 2002 to five women who alleged inappropriate behavior by O’Reilly. As one might expect, O’Reilly denies any wrongdoing and, according to The Wall Street Journal, claims that his successful career on television makes him a “target” – this despite the fact the he personally has paid out $10 million to settle some of the harassment claims. Despite these claims, 21st Century Fox, Fox News‘ parent company, has stood behind O’Reilly – but all that could be changing. As CNN Money reported on Tuesday, BMW of North America, Hyundai, and Mercedes-Benz are all pulling ads from “The O’Reilly Factor” in the wake of the New York Times report. 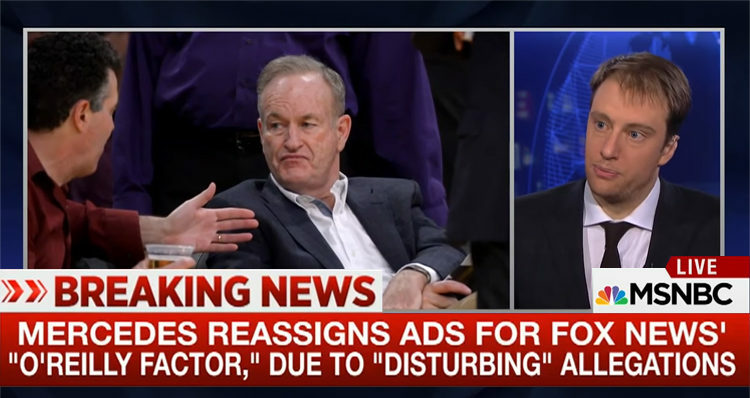 “Hyundai currently has no advertising running on The O’Reilly Factor. We had upcoming advertising spots on the show but are reallocating them due to the recent and disturbing allegations. BMW became the latest advertiser to suspend its ads on “The O’Reilly Factor,” releasing their own email statement mid-morning on Tuesday. “In light of the recent New York Times investigation, BMW of North America has suspended its advertising with ‘The O’Reilly Factor,'” the statement read.